Our lives will be judged not on the basis of accomplishments or service, but on the degree of surrender to the Law of the Spirit…in REALITY. Our eternal destiny depends on it. Not everyone who says to Me, ‘Lord, Lord‘ will enter the kingdom of heaven, but he who does the will of My Father who is in heaven will enter. “I never knew you.” The word ‘know’ here means experiential, and implies the intimacy of relationship. It can also mean ‘approval.’ “What you did was without My presence or My approval.” The Lord wants to be deeply involved with you in every moment, in every situation, and His intimacy is to produce what He wants, when He wants it, and done in the way He directs—all by the power of the Spirit. Anything less than this absolute obedience, Christ Jesus counts as lawlessness. Your eternity will be set by the measure of your REAL surrender to the Holy Spirit and to His desires. 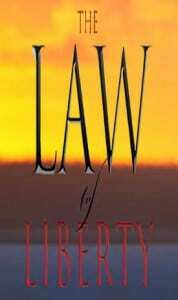 Learning More About the Law of Liberty #23 The Kingdom and the King #22 The Abundantly Sufficient Holy Spirit #20 May God Reduce Us to One Law!